One day in April 1517, a young lecturer in biblical studies named Martin Luther visited a small German market town and was outraged by what he saw. In the town's central square, a representative of the Pope had set up a stand and was selling absolutions from sin to a long line of eager customers. These formal documents, called Indulgences, pardoned the bearer and his relatives - alive or dead - from any punishment for past or future sins. "As soon as the coin in the coffer rings, the soul from purgatory springs," cried the papal representative. It was a lucrative business. Angered, Martin Luther composed a list of 95 reasons why the practice of Indulgences defied the doctrine of the Catholic Church and sent his list in a letter of protest to his archbishop. 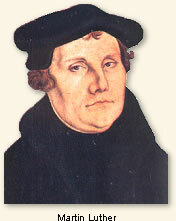 His complaint struck a chord of discontent within the Church and soon other protestors - Protestants - rallied to support Martin Luther's cause. The Protestant Reformation was underway and with it began decades of religious conflict and bloodshed. In 1565, the race for territory in the New World combined with the religious wars of the Reformation to spark a massacre on the shores of Florida. "...They were all Lutherans, and ordered to be put to death..."
By the 1560s, the French Protestants - Huguenots - were looking to the New World to establish a Protestant state in which they could practice their religion. They sent an expedition to the St. Johns River area of modern-day Florida and began a colony near what is now the city of St. Augustine. It was not long before news of this French intrusion reached the Spanish court in Madrid. To Phillip II of Spain the French were not only trespassing on land assigned by the Holy Church to the Spanish Crown, but they were also heretics violating the faith he was sworn to uphold. His immediate reaction was to dispatch one of his most brutal commanders, Pedro Menendez, at the head of a fleet of eleven ships and 1000 troops to uproot the French interlopers. Reduced to five ships, the Spanish fleet landed on the Florida coast on September 4, 1565. The French Protestants split their forces, leaving a small number at their fort while the rest took to the sea to attack the Spanish. Gale winds blew the French ships out to sea in disarray while Captain Menendez attacked the French fort massacring its inhabitants. One by one, the French ships wrecked along the Florida coast and a group of 200 survivors trekked northward along the Matanzas Inlet towards their fort. "On Friday, the 28th September, and while the captain-general was asleep, resting after all the fatigues he had passed through, some Indians came to camp, and made us understand by signs, that on the coast toward the south there was a French vessel which had been wrecked. Immediately our general directed the admiral to arm a boat, take fifty men, and go down the river to the sea, to find out what was the matter." "He said there should be in all twelve men to go in a boat, and two of them Indians, who would serve as guides. We set off immediately to descend the river to the sea, in search of the enemy; and, to get there, we had to march more than two leagues through plains covered with brush, often up to our knees in water, our brave general always leading the march. When we had reached the sea, we went about three leagues along the coast in search of our comrades. It was about ten o'clock at night when we met them, and there was a mutual rejoicing at having found each other. Not far off we saw the campfires of our enemies, and our general ordered two of our soldiers to go and reconnoiter them, concealing themselves in the bushes, and to observe well the ground where they were encamped, so as to know what could be done. About two o'clock the men returned, saying that the enemy was on the other side of the river, and that we could not get at them. Immediately the general ordered two soldiers and four sailors to return to where we had left our boats, and bring them down the river, so that we might pass over to where the enemy was. Then he marched his troops forward to the river, and we arrived before daylight. We concealed ourselves in a hollow between the sand-hills, with the Indians who were with us; and, when it came light, we saw a great many of the enemy go down the river to get shell-fish for food. Soon after we saw a flag hoisted, as a war-signal. Our general, who was observing all that, enlightened by the Holy Spirit, said to us, 'I intend to change these [clothes] for those of a sailor, and take a Frenchman with me (one of those whom we had brought with us from Spain), and we will go and talk with these Frenchmen. Perhaps they are without supplies, and would be glad to surrender without fighting.' He had scarcely finished speaking before he put his plan into execution. As soon as he had called to them, one of them swam towards and spoke to him; told him of their having been shipwrecked, and the distress they were in; that they had not eaten bread for eight or ten days; and, what is more, stated that all, or at least the greater part of them, were Lutherans. Immediately the general sent him back to his countrymen, to say they must surrender, and give up their arms, or he would put them all to death. A French gentleman, who was a sergeant, brought back the reply that they would surrender on condition their lives should be spared. After having parleyed a long time, our brave captain-general answered 'that he would make no promises, that they must surrender unconditionally, and lay down their arms, because, if he spared their lives, he wanted them to be grateful for it, and, if they were put to death, that that there should be no cause for complaint.' Seeing that there was nothing else left for them to do, the sergeant returned to the camp; and soon after he brought all their arms and flags, and gave them up to the general, and surrendered unconditionally. Finding they were all Lutherans, the captain-general ordered them all put to death; but, as I was a priest, and had bowels of mercy, I begged him to grant me the favor of sparing those whom we might find to be Christians. He granted it; and I made investigations, and found ten or twelve of the men Roman Catholics, whom we brought back. All the others were executed, because they were Lutherans and enemies of our Holy Catholic faith. All this took place on Saturday (St. Michael's Day), September 29, 1565. I, Francisco Lopez de Mendoza Grajales, Chaplain of His Lordship, certify that the foregoing is a statement of what actually happened." Lopez, Francisco - account appears in: Thatcher, Oliver J., The Library of Original Sources, vol. 5 (1900); Dickens, A. G., Reformation and Society in Sixteenth-century Europe (1966); Fiske, John, The Discovery of America vol. III (1902). "The Spanish Massacre the French in Florida, 1565," EyeWitness - history through the eyes of those who lived it, www.eyewitnesstohistory.com (2002). 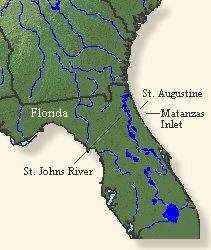 The massacre occurred along Florida's Matanzas Inlet - Matanzas means "slaughtering" in Spanish. Those French not killed were enslaved and sent to the galleys.